This was requested on Facebook, so here we go…. Okay, nerves of steel to take the caramel all the way to oozy toffee. If you love making pastry it’s going to be so much better home made. But if you panic at pastry, then use a super top brand such as Careme. It is worth paying that extra for the quality. And if you want to go all the way, make a chocolate pastry with dutch cocoa. You need enough to line a single 24cm tart tin. 325g sugar – I used caster but you can use normal white sugar. Approx to taste 1 to 1.5 teaspoons of sea salt flakes. I use Maldon and the quantity is very much to taste. Make your tart base – keep it thin. I worked with a 24cm tart case and that served eight people with plenty left over because small slices are required. Bake your pastry blind and then bake to golden. If it’s a chocolate version, follow a recipe for baking to perfect crispness. Let it cool. Begin making your toffee by first putting the cream and butter in a small saucepan and bring to the boil. Remove from heat. Set aside for the time being and go to the next stage. In another saucepan (medium), stir the sugar and water over a low heat and stir to dissolve the sugar. You want no crystals in it. Turn up the heat and stop stirring to let it boil. Forget sugar thermometers. This is instinct. It’s going to take about six to seven mins before you have golden caramel and then you have to grit your teeth and watch it all go a fraction scary as your caramel goes into a dark toffee. Now…be ready and remember, it’s frighteningly hot. Off the heat and very quickly tip in the cream mixture. It’s going to splutter and carry on so I have a tea towel strategically placed to protect my hand holding the saucepan. It will calm down quickly but it does keep cooking a little. Add salt. If you have the nerve, you can put it back on the heat and cook it for another minute as I do to thicken it up. Set aside to cool and go oozy. I left mine overnight but you can tip it straight into your cooled pastry case and put it into the fridge for an hour or so. 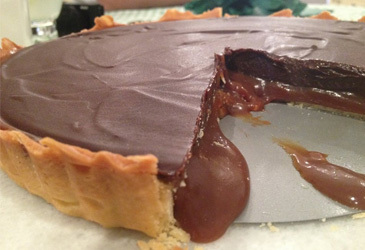 To make the ganache, put your chocolate and cream into a small pan and over your lowest heat melt the chocolate until you have a smooth, glossy mix. Leave it to stand and thicken up. I left mine for about an hour. Pour the chocolate over the toffee and back into the fridge for however long you need. I left mine for a couple of hours. Let it warm up slightly before serving. I would cut with a hot knife too for clean slices and remember that toffee is going to ooze and take the chocolate with it so back into the fridge with what you don’t eat. Some people like to sprinkle salt onto the chocolate – I don’t. I can’t imagine crunching on salt crystals with this dessert. I just make the toffee salty enough and I’d add some glamour gold leaf for drama if you want to impress but I promise the dessert is going to impress come what may. I serve with a dash of runny cream to cut through the sweetness but even so it is meant to be a rich, unctuous, totally decadent taste experience … enjoy!